Volunteering on our Care & Community project in the vibrant capital city of Lomé is an amazing opportunity to make a real difference in underprivileged communities. This is a great project for anyone who loves working with children and who also wants to do some hands on renovation work. In the mornings, volunteers will work in children's day care centres, nurseries or kindergartens doing basic educational activities with the children. 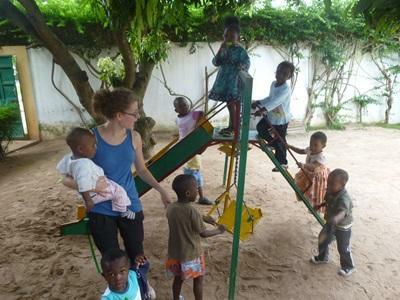 Volunteers will play games with the children and participate in day-to-day work such as feeding the children. In the afternoons, volunteers will get the opportunity to do some light renovation work at a local school or community building project. During the weekend the group will take a trip to Kpalimé, a mountain village surrounded by cocoa plantations. This will give volunteers a chance to explore the scenery, visit waterfalls, and see a more traditional, rural way of life.